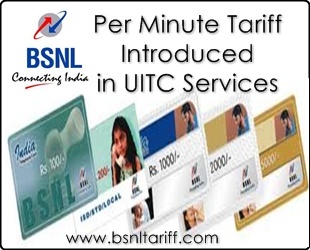 Leading Telecom Operator Bharat Sanchar Nigam Limited (BSNL) launched of Minute based Tariff under UITC (Universal India) Landline Services. The Competent Authority of BSNL has announced to revise the present per second tariff which was introduced by merging the features of ITC offers Local, STD and ISD call under per minute tariff. Customers of GSM Postpaid or BSNL/MTNL can make calls from Prepaid card India telephone card (ITC) of denominations Rs.20/- Rs.55/- Rs.110/- Rs.300/- Rs.550 and Rs.1100/-.